This unit came to me from Lincoln Berean Church where it had been in service as the parametric on the pastor's channel. The story goes that in the middle of a sermon, channel A went silent. Chalking it up to a bad channel, the next time channel B was used and the same thing happened. The installed system in the big room sounds very nice and had so far had no major issues, especially a full silence episode so this unit got black-listed as soon as it was patched around. I received it in a dismantled state from a "no additional time available to give to this" call from their system tech. 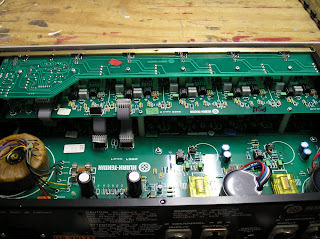 He had purchased new switches to replace a few that were a little dirty and said Klark Teknik support suggested re-wetting the vertical 4-position hard soldered connectors between the boards. 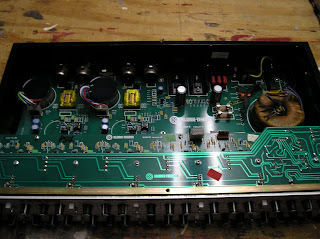 Repair was then replacing all the pushbutton switches and re-wetting the vertical connectors. This was done after screwing the boards back together into the A and B modules to avoid having stress on the joints when reassembled. Several of the connections looked possibly broken and a few of them were in fact under tension and released when the solder melted. Since the problem was likely related to heat and intermittent connections, the only true test is to put it back into service on a "money channel" and tempt Murphy. Last Sunday I patched it into the pastor's and the (electronic) kick drum channels at my church and tweaked away. In operation, the unit was a bit noisy to have channels enabled with no boost/cut but otherwise was the ticket for those sources. 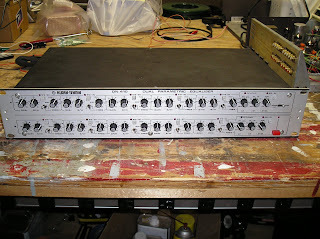 Compared to the Mackie 1604's single swept mid EQ, there was plenty of tweaking room available for a nice kick thump. The ability to narrow the bandwidth of a few EQ sections for the pastor's head-work mic was so much nicer than the mixer EQ's compromise. Two services worth of music and sermons gave no issues, even under some mechanical stress on the case so everything seems to be good to go.